Point MacKenzie: Tank Farms and Coal Loading or 2.4 Dimond Centers of Retail? What happens when the land use plans for one large state-funded project – the Alaska Railroad extension to an industrial Port MacKenzie – completely conflict with the land use assumptions of another state-funded project – the Knik Arm Bridge? The Mat-Su Borough has approved plans for heavy industry and manufacturing around Port MacKenzie. However, the Knik Arm Bridge and Toll Authority (KABATA) Financial Plan assumes that the equivalent of 2.4 Dimond Centers of retail space will be built at Point MacKenzie. Could KABATA’s retail numbers result from the need to generate the traffic figures large enough to cover the bridge costs? 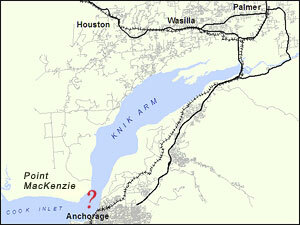 On February 1, 2011 the Mat-Su Borough Assembly adopted the Port MacKenzie Master Plan Update. The vision of the Plan is “resource development” and the plan outlines land use consistent with that vision: mineral and forest products processing, a petrochemical plant, metal fabrication for oil and gas modules, power generation and other manufacturing industries. A possible liquefied natural gas (LNG) plant, coal loading, and tank farms are proposed uses clustered on the 7,600 acres surrounding the Port. In the Port Master Plan, a small zone of commercial and light industrial businesses are planned around Lake Lorraine as a compliment to the local industrial area. There is no mention of retail at Point MacKenzie. In 2007, KABATA toll and traffic consultant Wilbur Smith Associates (WSA) projected 8 million square feet of building and a billion dollars of investment by 2030 including the big traffic generator of 1,740,000 square feet of retail, (see pp. A-31-36). [ Dead link- the KABATA web site is no longer online ] How realistic is 1,740,000 square feet of retail at Point MacKenzie? At 728,000 square feet of retail and entertainment space, Anchorage’s Dimond Center is Alaska’s largest mall. Tikahtnu Commons off the Glenn Highway on Anchorage’s east side is now over 500,000 square feet with plans to double that amount. The WSA retail projection amounts to 2.4 Dimond Centers or over 3 Tikhatnu Commons at Point MacKenzie by 2030. To generate the 36,000 trips a day KABATA’s Financial Plan assumes in 2035, most of those shoppers will need to come from Anchorage and they presumably will all prefer to pay a one way car toll of $8 (commercial $28) than shop in downtown Anchorage, the Dimond Center, Tikahtnu Commons or other locations. (CH2MHILL used Scott Goldsmith’s ISER demographic data to project less than half as many trips in 2035 or 17,700, see 9/22/11 post). In 2010, Steve Colt of UAA’s ISER estimated 3,500 industrial jobs at Point MacKenzie by 2030. The 2007 WSA Traffic Study projected 6,740 jobs at Point MacKenzie by 2030. Curiously, when in 2011 KABATA released the WSA traffic analysis zone(TAZ) maps, those 6,740 jobs in 2030 had grown to 13,828 jobs in 2035, see Point MacKenzie TAZ zones # 136 and # 593 [ Dead link- this information is no longer online ]. Terry Maynard, a retired federal economist working with a Virginia citizens group, has documented that KABATA traffic and toll consultant Wilbur Smith Associates (WSA) has overestimated toll revenue by an average of 118% for the first five years US toll facilities were open. A summary of the study [ Dead link- this article is no longer online ] appeared in Toll Road News. Most of the data used in the analysis came from a study by the Transportation Research Board of the National Academy of Sciences. Maynard also used data from recent projects where WSA provided traffic and toll revenue projections. A 118% average overestimation error is consistent with the 103% overestimating difference between the 17,700 vehicles a day in 2035 that CH2MHILL modeled from Scott Goldsmith of ISER’s demographic data for Anchorage’s Highway to Highway project. WSA projected 36,000 vehicles a day in 2035 and the revenue from that number is in KABATA’s financial plan. The effect of overestimating Knik Arm Bridge toll revenue is discussed in Jamie Kenworthy’s revised Real Finances of the Knik Arm Bridge paper that projects a $2.5 Billion deficit under the current Public Private Partnership (P3) structure. Perhaps aware of large bridge deficits under the P3 structure, last week at a 3/1/12 luncheon held by radio-host Dan Fagan, Anchorage Mayor Dan Sullivan endorsed a no toll bridge that the state would fully fund. It’s time for a more factual discussion about the Knik Arm Bridge. If you would like a presentation, please contact KABATA at 269-6698. The meat of the email was contained in two attachments: The first attachment is a “call and response” by Mr. Foster apparently in response to issues raised in presentations questioning the Knik Arm Crossing Finances. The second attachment is a questionable view of Government Hill neighborhood before and after the bridge construction. Below are nine assertions, labeled “Myths” in Mr. Foster’s documents, each followed by an explanation by Mr. Foster and then a point by point response by Bob French and Jamie Kenworthy. Kenworthy and French’s remarks include links to supporting documents, in many cases KABATA’s own documents – that underlie their assertion that the Knik Bridge will end up costing the state of Alaska $5.5 Billion. An analysis of before and after images of Government Hill neighborhood follows the “Myth” discussion. Mr. Foster: Proposed legislation will limit state obligations. Existing statutes and contract provisions protect the state’s interest. French and Kenworthy: The bills KABATA is now seeking to have the legislature pass, HB 158 and SB80 would make any contract or obligation of KABATA, “obligations of the state”. HB 159 and SB 79 seeks to give $150 Million to KABATA for a “Reserve Fund” to make up for toll shortfalls. KABATA estimates that they will sign a contract with the contractor for $2.98 billion in availability payments over 35 years. (See column 1 p.4 in KABATA’s 12/16/2011 Financial Plan ) plus the contractor will receive the net cash flow of $920 million (column 8, p. 5). In effect, the contract is a state commitment of nearly $4 billion plus KABATA administrative costs and minus toll revenue collected. A recent independent study of the national track record of Wilbur Smith, [ Dead link- this study is no longer online ] the consultant KABATA used for the traffic and toll estimates shows that Wilbur Smith consistently overestimates the first five years of toll revenue on projects by 2.2 times. In the case of the Knik Arm Crossing, KABATA’s P3 contractor takes the risks of whether or not the construction cost estimates are accurate. But the State of Alaska the state will have the full downside risk of the toll shortfall if Wilbur Smith’s toll revenue estimates are wrong. KABATA’s own Financial Plan that was submitted to the federal government 12/30/11 for a $308 M TIFIA loan says on pages 8 and 24.2 that “If ending balance falls below $50 M, the state will replenish the amount back to $50 million.” A continually replenished “reserve fund” is by definition, unlimited. 2. Assertion: The Knik Arm Crossing will use up all of the money that would normally go toward building roads in Anchorage. Mr. Foster: Conversely, the revenue generated by tolls will help fund future transportation in Anchorage and statewide. Limited upfront public funds frees up capital for projects statewide. Any state appropriation associated with SB 79 or SB 80 to cover the required availability payments are assumed to be in excess of what is identified in the MTP and will not adversely affect the amount of state funds anticipated to be committed within the AMATS area. lf the actual financial plan for the Knik Arm Crossing requires more state investment or is required to draw from sources such as federal NHS funds, that affect the implementation of other MTP projects, this MTP will have to be amended to reassess the Knik Arm Crossing, remove roadway projects from the network, resulting in worsening congestion, or new revenues sources and assumptions will need to be brought forward. Given that the toll shortfall could be well over $1 Billion, is it reasonable to assume that Legislators from other parts of the state will not reduce state transportation funding for Anchorage, given that AMATS decided to move the bridge forward, despite being warned that toll revenue was likely to be half of KABATA’s predictions? 3. Assertion: KABATA’s population forecasts are much higher than other predictions. Mr. Foster: KABATA’s population forecasts are in line with other forecasts, including the University of Alaska’s Institute of Social and Economic Research (ISER), the Alaska Department of Labor, and Woods and Poole. Our forecast differs from ISER’s by less than 1%. French and Kenworthy: We would love to have Mr. Foster point out to us exactly where KABATA lists their actual current population forecasts. If they are listed in a public document, they are well hidden. Below is an excerpt from a letter by Scott Goldsmith of ISER to Senate and House Finance Chairs regarding KABATA’s and ISER’s population forecasts. The Wilbur Smith Associates (WSA) February 25, 2011 letter to Andrew Niemiec entitled Proposed Knik Arm Bridge Traffic and Toll Revenue Update Study purports to use the 2009 ISER population projection as well as those from other analysts, but inexplicably the Study does not present any population numbers. It is thus impossible to verify what numbers were actually used, and more importantly how they drive the prediction of tolls. 4. Assertion: KABATA is asking for public funds to pay the private partner a 12% rate of return. Mr. Foster: KABATA is not guaranteeing any rate of return to the private sector. The private sector return is based on their performance. The private partner’s risk is in financing, designing, building, operating and maintaining the project. If they underestimate their costs in any of these areas, their profits will be reduced and they may even lose all or part of their equity. Toll Revenue would be halved from $4.6 Billion to $2.3 Billion. KABATA estimated 36,000 trips a day in 2036. However, when CH2MHill modeled demographic projections from Scott Goldsmith of ISER for the Highway to Highway project, CH2MHill estimated less than half that traffic or 17,700 vehicles a day. This is consistent with Wilbur Smith Associates overestimating traffic by 2.2 times. KABATA has been turned down at least 5 times for low cost TIFIA and TIGER loans but the Financial Plan listed above (p. 1) still includes $308 Million in federal TIFIA loans. 5. Assertion: KABATA promised that the bridge would not need any more public funds. Mr. Foster: The project reserve fund is similar to a line of credit. The project reserve fund will be paid back with future toll revenue. French and Kenworthy: Before 2011, KABATA testified at many forums (too numerous to list here), that the Knik Arm Bridge would not require any additional state or local funds. That all changed in 2011, when KABATA asked for SB 79 and 80, and HB 158 and 159. That is why AMATS in the 2035 MTP Update had to remove key “Firewall” provisions ( or view archived copy here . )that had been inserted as conditions into Chapter 12 of the LRTP by the Assembly. Refer to the bottom of the center and upper right columns on page 6-30 of Chapter 6 of the 2035 MTP Update [ Dead link- this information is no longer online ]. 6. Assertion: The Knik Arm Crossing will cost $5 billion dollars. French and Kenworthy: The first page of the the KABATA Financial Plan, [ Dead link- the KABATA web site is no longer online ] does indeed show the cost of a billion dollar bridge but that includes none of the financing costs (If you borrow $200 K to buy a house, you certainly end up paying far more than $200 K when the mortgage is paid off 30 years later). KABATA’s financial document listed above shows a positive cash flow only 16 years after the 2016 estimated opening of the bridge (p7, right hand column). That leaves them in a situation similar to that of trying to make up for paying only partial mortgage payments for 16 years. What is not included in the $1 billion cost of the bridge is the $3 billion in availability fees that KABATA estimates will be paid to the P3 Contractor (third column, p 7) and the $920 M in “net cash flow” (see item 4 above) that “public private partner” will be entitled to by the time the Phase 1 bonds will be paid off. KABATA estimates almost $4 billion in obligations the state is proposed to guarantee. 7. Assertion: KABATA says they can fit 36,000 cars a day on a two lane bridge. Mr. Foster: KABATA will expand the bridge deck and roadway to a four lane facility when traffic warrants. French and Kenworthy: KABATA’s toll revenue forecast the revenue of 36,000 vehicles in 2036 but only the cost of a 2 lane Bridge and 2 lanes on the approach roads on the Mat Su side are included in what KABATA estimates as Phase 1. At around 18,000 vehicles a day on restricted highways, most expressways have to go to 4 lanes to accommodate traffic. The 4 lanes of the Glenn Hwy at Eklutna Flats near the Mat-Su-Anchorage line now carries about 28,000 vehicles a day. The problem is the KABATA toll revenue forecast and financial plan count on the revenue from over 18,000 vehicles in 2022 but does not include the cost of the 4 lanes of Phase 2 until 2030. How is this possible? And the cost of Phase 2 by KABATA’s estimate is $617 M by KABATA’s number (p. 23.1 and over $800 M by an FHWA led process which in 2009 KABATA participated in 2009. There is discussion in the 2035 MTP Update stating that Phase 1A is a 2 lane bridge, and Phase 1B adds a 4 lane bridge and approach roads.BUT, KABATA is not showing those costs in their latest TIFIA Letter of Interest [ Dead link- the KABATA web site is no longer online ]. 8. Assertion: KABATA is telling people they need to be out of their houses by July. Mr Foster: KABATA is in active negotiations with property owners on Government Hill. Purchase and relocation agreements are still being developed with individual owners and tenants. French and Kenworthy: A key difference here. We heard from a business owner, not a home owner that they were told by KABATA that they would need to vacate by the end of July 2012. 9. Assertion: The State is taking all the risks. Mr. Foster: One of the primary reasons to enter into a Private Public Partnership is to transfer risks to the private sector. The private sector partner in this case will take on the risk of financing, designing, constructing, operating and maintaining the bridge. French and Kenworthy: But the “private sector partner” takes no risks that the toll revenues will not be sufficient to make the “Availability Payments”. Under the “public-private partnership” structure that KABATA is now committed to, the contractor takes the construction cost risk (which any contractor doing a block of sidewalk would do) but really none of the finance risk since the contractor would have a 36 year contract promising “Availability Payments” guaranteed by the State of Alaska. Four case studies of WSA toll road T&R forecasts indicate that WSA’s overestimates have had major adverse impacts on toll road owners and operators in the subsequent years of operation. In two of the studies, the toll roads went into bankruptcy within a decade. In all four cases, bondholders took substantial losses; equity investors lost most of their value if they were not wiped out in distress sales; and the necessary restructuring added tens, if not hundreds, of millions to debt servicing costs over extended payment periods for state and local jurisdictions. Toll road users were often forced to absorb those extra costs through higher tolls. What can not be seen in Mr. Foster’s “Before and After” depictions of Government Hill, is the effects of 3 to 4 years of construction, digging up the ONLY access road into the community, the loss of property values, the impacts to Government Hill Elementary School, which is a “magnet” Spanish Immersion School attracting students from all of Anchorage, and the many businesses that will go bankrupt because of lack of business due to construction. After repeated requests by citizens and the local planning authority, Anchorage Metropolitan Area Transportation Solutions (AMATS), the Knik Arm Bridge and Toll Authority [ Dead link- the KABATA web site is no longer online ] (KABATA) released the traffic analysis zone (TAZ) data it used in making toll revenue projections for its Financial Plan. This map [ Dead link- this information is no longer online ] of Mat-Su and Anchorage shows the population and employment data KABATA consultant Wilbur Smith and Associates used to generate their forecast of the tolls necessary to pay off Knik Arm Bridge bonds and other costs. By clicking on various traffic analysis zones (hat tip to Doug Tosa of Alaska Center for the Environment for putting the KABATA data to each TAZ zone in this easy to use format), users can see the amount of growth KABATA believes will occur in each neighborhood. Clicking on the area [ Dead link- this information is no longer online ]around Point MacKenzie (TAZ zones # 136 and # 593, i.e., immediately adjacent to the proposed Knik Arm Bridge), shows that KABATA projects 13,828 people to work there in 2035 compared to 55 today (see the State of Alaska’s Department of Commerce site [ Dead link- this information is no longer online ] for additional Point MacKenzie information). KABATA’s Financial Plan counts on car drivers paying a $7.99 one way toll and a $28.78 commercial vehicle toll in 2035. The 2010 Census counted 88,995 people living in the Mat-Su Borough. In 2007, Insight Research Corporation of Dallas, Texas projected that 250,700 people will live in the Borough in 2030, the equivalent of adding Palmer, the Borough’s second largest city, to the Borough every year for 20 years. Because of changing economic conditions, citizens and AMATS, the State/Muni transportation planning organization, then asked KABATA to revise the Mat-Su population projection. KABATA’s traffic and toll consultant, Wilbur Smith and Associates, reduced their Mat-Su Borough population in 2035 to approximately 200,000. In contrast, Scott Goldsmith of UAA’s Institute of Social and Economic Research (ISER) projected about 160,000 people living in the Borough in 2035, a number that was used as the basis for the draft 2035 Anchorage Metropolitan Transportation Plan [ Dead link- this information is no longer online ]. Interestingly, a 2007 study done for KABATA by Insight Research showed (p. A-7) [ Dead link- the KABATA web site is no longer online ] only 6740 jobs in TAZ zones 136 and 593 at Point MacKenzie twenty years after the bridge was scheduled to open in 2010. That is slightly less than half the 2011 estimate KABATA projected for 2035, 19 years after the Bridge is projected to open in 2016. So what changed between 2007 and 2011 that made the KABATA consultants double the estimated jobs at Point MacKenzie 19-20 years after the Bridge opened? With Wilbur Smith having to reduce the population forecast from 250,700 in 2030 to around 200,000 in 2035, the only way KABATA’s consultant could still project enough traffic and tolls to pay off Bridge costs is by adding “2-way” traffic, with significant traffic leaving Anchorage to go to work at Point MacKenzie. Observing KABATA consultants change population numbers and jobs numbers by such a large amount, a skeptic might consider the 13,828 jobs at Point MacKenzie in 2035 as less an objective forecast from an independent source than a predetermined number from a firm willing to serve a client that needed to show the necessary traffic and toll revenue to pay off Bridge costs. An independent financial estimate assuming lower population and employment numbers projects an annual $55 million/year in bridge deficits from the projected year the bridge opens to 2035, see the Real Finances paper. A $55 million annual deficit is more than the approximately $30 million a year in total state and federal funds that Anchorage and Mat-Su Borough have each averaged during the last ten years for all transportation projects. As the legislature convened last week, three media stories, a blog and two editorials question the financial viability and political support for the Bridge. In a story that was picked up nationally, the Anchorage Daily News Sean Cockerham article [ Dead link- this article is no longer online ]discloses that Governor Parnell is non-committal on further Bridge financing. A KTVA story [ Dead link- this story is no longer online ]focuses on the dilemma of Government Hill residents weighing the loss of their property for a project that lacks financing. Editorials last week in the Mat-Su Valley Frontiersman ( OR view and archived copy here. ) and the Anchorage Daily News [ Dead link- this article is no longer online ], argue against further public funds for the project. Even the normally pro-development Anchorage Daily Planet [ Dead link- this article is no longer online ] asks why the State of Alaska needs to own a Subway Sandwich shop for a project that may never happen. A blog post written by Anchorage Assemblyman Patrick Flynn ( or view archived copy here . )highlights how the AMATS Policy Committee is poised to approve a new version of the Long Range Transportation Plan that removes an important “Firewall” inserted by the Assembly into the last LRTP. Losing that “Firewall” means that transportation projects that Anchorage needs are threatened when bridge costs exceed KABATA’s predicted revenues. The Anchorage Planning and Zoning Commission received a revised cost estimate of $2.6 Billion for the proposed state guarantee to backstop the Bridge’s expected toll shortfall from financial analyst Jamie Kenworthy, see The Real Finances of the Knik Arm Bridge (updated on January 9, 2012). The P&Z Commission will deliberate further on Anchorage’s Metropolitan Transportation Plan (MTP) on January 30, 2012. Kenworthy’s paper estimates that $1.1 Billion of the Bridge deficit will occur by 2035 or about half the funds that the draft MTP identifies as needed for road projects in the Anchorage area before 2035. Click here [ Dead link- this document is no longer online ] for the latest draft of the MTP. 1. In 2011, the Knik Arm Bridge and Toll Authority (KABATA) was turned down for a $308 million low cost federal TIFIA loan and a $45 Million federal TIGER grant. Both the low cost federal loan and the grant are included in KABATA’s financial plan and the draft MTP. Click here [ Dead link- the KABATA web site is no longer online ] for a copy of KABATA’s latest Bridge financials. 2. 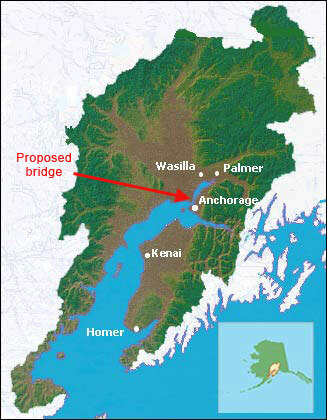 In November, in response to concerns that the Bridge would exacerbate Cook Inlet siltation challenges that would impact “essential fish habitat” and further limit shipping access, KABATA signed an agreement with the US Army Corps of Engineers to expand the span of the Bridge from 8200′ to 9200′. Click here for a copy of the KABATA’s permit application with the Corps of Engineers. that the contractor would pay for Phase 2 so the draft MTP need not include the full capital cost of the 4 lane project. The current MTP shows full capital costs for all other projects. Finally, this month Senator Coburn (R-OK) cited the release to KABATA by the Federal Highway Administration of $15.3 Million in right of way funds as project #6 in his "2011 Wastebook", [ Dead link- this information is no longer online ] his list of the top 100 wasteful federal projects. FHWA Responds to Government Hill Round II: By What Authority Was the Cart Put Before the Horse? No further state and local funds for the Bridge. The Knik Bridge project has yet to be financed by either the private sector or the Alaskan legislature. Yet, KABATA has sent letters (see 9/22/11 post below) requiring that property owners grant access to their property for acquiring appraisals as a first step toward the state acquiring the land for the project by sale or eminent domain. Rather than directly respond to French’s contention that the project has neither financing or any evidence of meeting the condition of the local unit of government’s conditions and FHWA-accepted Transportation Plan, the FHWA response laughably argues that the public should have commented on the Right of Way acquisition funds in the 2009 revision of the Statewide Transportation and Improvement Program. Click here to view the French letter and Click here to view the FHWA response. Train Wreck Between Bridge Finances and Anchorage’s Transportation Plan? Citizens opposing further state or local funds for the Knik Arm Bridge have a PowerPoint presentation arguing that “Train Wreck” is the best description of what will occur when an estimated $1.1 Billion in Bridge toll shortfall between 2016-2035 collides with the $2.5 Billion needed in Anchorage to cover road, public transportation, and bike, pedestrian, and trail improvements now outlined in the draft 2035 Metropolitan Transportation Plan (MTP). Click here (updated on 1/25/2012) for the Knik Arm Bridge and MTP PowerPoint. The MTP will be taken up by the Anchorage Planning and Zoning Commission and then the Anchorage Assembly in early 2012. For a list of current projects included in the draft MTP click here. The MTP “assumes” that the Alaska legislature will approve $150 Million in state General Funds for the Bridge, provide KABATA a state guarantee for any contracts KABATA signs, and that the tolls will prove sufficient to repay the $150 Million by 2035. What is included in Phase 2. The original Phase 2 included connecting Ingra-Gambell to the expanded 4 lane Bridge and 4 lanes to Knik Goose Bay Road but the estimate for that work was estimated by FHWA in 2009 as costing $815 Million, considerably more than KABATA’s $230 Million. How anything less than 4 lanes from downtown Anchorage to Knik Goose Bay Road in the Mat Su can generate the toll revenue in KABATA’s Financial Plan. Where the extra $230 million in toll revenue comes from since no Phase 2 costs were included in in KABATA’s estimate of $4.8 Billion in toll revenue in KABATA’s Financial Plan needed to finance just Phase 1. See p. 6-33 for the MTP discussion of Bridge finances. KABATA Chairman Mike Foster has an Anchorage Daily News Compass piece,[ Dead link- this information is no longer online ] arguing that KABATA’s population and traffic numbers are “nearly identical” to the numbers Scott Goldsmith of UAA’s Institute of Social and Economic provided AMATS that are used as the basis for the MTP. The MTP cites KABATA’s estimate of 36,000 trips a day crossing the proposed Knik Arm Bridge in 2035; when Ch2M Hill used ISER’s population projection to estimate Bridge traffic in 2035 their number was less than half the KABATA number or 17,700 trips a day. Coincidentally or not, the three teams selected from the six teams applying appear to have the greatest participation of Alaskan-based suppliers. On another front, the local Anchorage transportation planning agency AMATS has requested KABATA to release the traffic analysis zone (TAZ) data upon which the optimistic Wilbur Smith traffic and toll revenue study was done. After a month of delay, AMATS has now received the TAZ data but it has not yet been made public. On September 25, 2011 a story in the Washington Post recapped the status of the controversial project for national readers and unearthed a private 2007 email from then Governor Sarah Palin in which she described the attempt to put further state funds into the project as “nonsensical.” For Post article, click here. Federal politicians, with lots of advice from lobbyists and back-home politicians and little oversight by actual taxpayers, pass these massive bills that require the people of every state to fund distant projects that they know nothing about and will never use. This may be “Don Young’s Way,” as the Knik Arm project is named in honor of the venerable Alaska congressman who keeps laboring to extract tax dollars from New York and Florida for his local road, but it’s also Congress’s way. This is what happens when you push road and bridge funding from the local area to the state to the federal government. And it leads to $14 trillion in national debt.